Location: Clergoux, in the Corrèze departement of France (Limousin Region). Notes: Château de Sédières (Castèl of Sediera in Occitan) is a castle of the department of Corrèze, on the town of Clergoux 130 hectares of forest, ponds and white water.The domain Sédières has a medieval castle of the fourteenth century which was redesigned during the Renaissance in the fifteenth and sixteenth centuries. It was built by John Boutier. A Renaissance fireplace on the second floor door painted a Latin inscription describing the passage of Henri IV. Of the four main buildings built in quadrangle with a courtyard built from the beginning of the building, there remains today a drawbridge across the moat and giving access to a door. The latter is flanked by two towers that opened on the courtyard. The square tower with four floors was located at the opposite corner to the north. It was classified Historic March 8, 1958 "Castle Sédières" basis Merimee, French Ministry of Culture. Castle Sédières was bought in 1965 by the General Council of the Corrèze and festival, the Sédières festival is organized from June to September since 1974. A century and a half after the construction of the castle, Dominique Sédières, great-grand-son of Jean Boutier definitely gave the surname of Boutier and began to rehabilitate the home of his ancestors. The campaigns of Italy had made him sensitive to the architecture and the spirit of the Renaissance. His marriage to a girl of Pierre-Buffière also allowed him to have sufficient wealth to consider large-scale works. Begun around 1535, with the very likely from artists who came to work at Montal (Lot), the site Sédières Castle and its surroundings and was completed in 1569. The ditches were filled and replaced with a terrace the surrounding wall that protected, but obscured the front courtyard, shot, buildings facing the main building demolished. On the top floor, another terrace offers a view over the ponds and forests of the area. Turrets capped pepperpot came decorate the facades. The lower part of the entry that received three loaders arcades, open, decorated with Corinthian columns. Of framed windows and ornate came to replace the old openings: light now came aplenty in the castle. Only few become useless battlements and moats remains of yet testified past the castle. The castle included in any kitchen and 13 rooms or rooms, some of them decorated with a monumental fireplace.At the end of the seventeenth century, Lentillac heirs places, aménagèrent a French garden. A chapel dedicated to Saint Laurent was built on the area in the eighteenth century. It was public, open to people of Clergoux and surroundings. Destroyed after World War II, it is assumed that she was in place of the caretaker's house. The heiress sold the castle in 1848 to Abraham Gabriel Delessert, prefect of police and stepfather of Count de Valon (owner of the castle of Saint-Priest-de-Gimel), who remained four years before selling in turn. 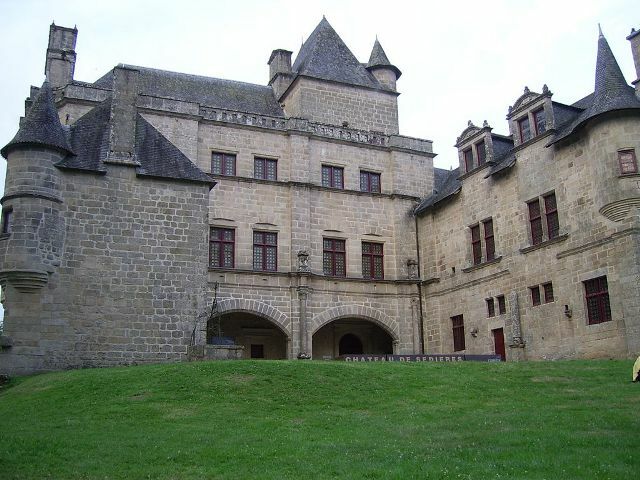 The castle was finally bought in 1861 by Colonel Adolphe Chanal, who later became a brigadier suite (1870), Commander of the Legion of Honor and member of Corrèze. The castle as the field, more than three hundred hectares had suffered abandonment. They were restored one and the other, with the desire to preserve the castle its style and character.